ViaBlue™ silver solder wire makes it possible creating solder points with lowest resistances. Throughout the professional cable assembly, it is absolutely necessary to connect the interfaces between cables and connectors with permanently high-end quality. With it's 4% silver content ViaBlue™ silver solder wire provides best conditions for maximum solder quality. The diameter of the silver solder wire is 1 mm. The melting point is 217°C. The solidification behavior has been significantly improved by adding cobalt. Thus, a finer and more homogenous structure is achieved compared to conventional silver solders. Due to the homogeneous structure it makes it possible to create smooth and shiny solder points. 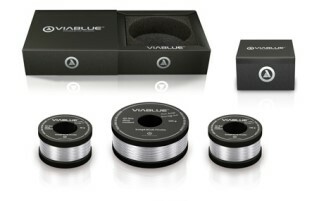 To improve the flow behavior and avoid dross formation the ViaBlue™ silver solder contains germanium proportionately. The high-end silver solder is available on spools in sizes 50g, 100g and 250g.